Say what you will about Yelp (psst: here and here), there's no denying that the review site has become our go-to source for opinions on local eats. Now, the company has released its own ranking of the top 100 places to "try-before-you-die" based on information gathered from millions of users. Using a technique incorporating the Wilson Score, their engineers were able to compile a list that took into account both star ratings and number of reviews to determine which spots are the most popular on Yelp. The establishments that made the list range from those hefty $$$$ spots to cheap eats, including the famed Le Bernardin at #45 and a cart with reindeer, elk and rattlesnake hot dogs in Denver . However, the restaurant that tops the list? 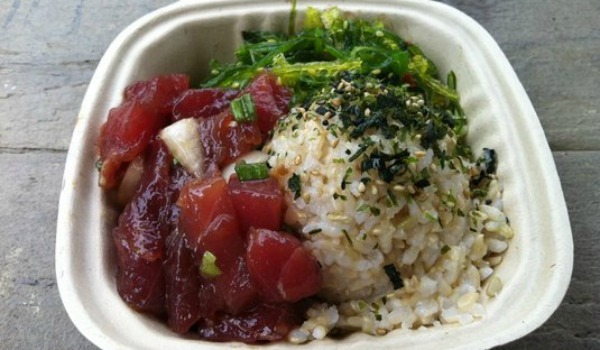 Da Poke Shack, a petite joint hidden within a condominium complex located in Kona, Hawaii. Yelpers deemed the place the Holy Grail of poke, giving it a strong rating of five stars from 615 reviews total. The bowls run about $8 each and come with a hearty amount of almost impossibly fresh Ahi tuna, as illustrated by this photo. For an extra $7, you can add garlic edamame and a cold can of Hawaiian beer. Needless to say, try to stop by next time you're on the big island.